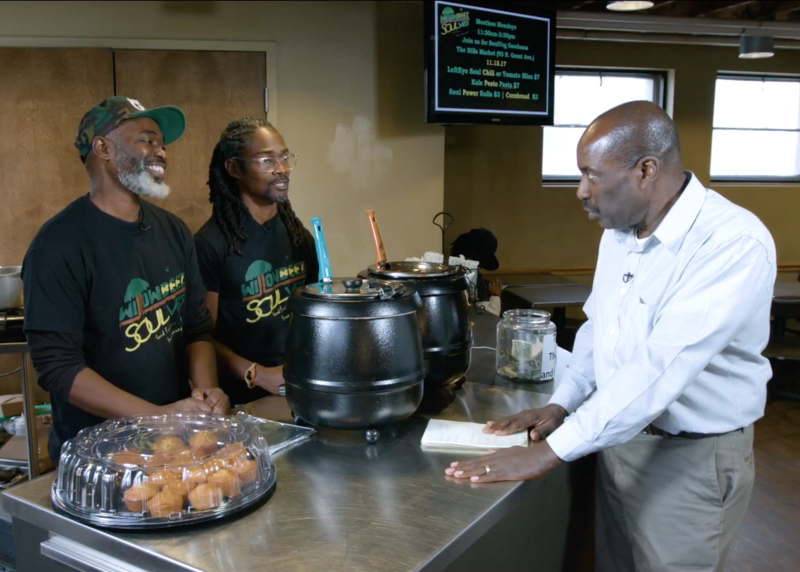 Columbus Neighborhoods producer George Levert interviews brothers Carnell and Malik Willoughby, of Willowbeez SoulVeg. With another successful season in the books, we’re now hard at work on the third season of the Columbus Neighborhoods weekly series, coming to a screen near you in October 2018. P.S. Have an idea for a Columbus Neighborhoods story? We’d love to hear about it! Leave a comment or send us a message. We reached some exciting milestones in Season 2 — including one of our videos hitting 1 million views on Facebook! While the segment was already extremely popular within our network, we have NPR to thank for sharing the video on their Facebook page, reaching thousands more people. NPR shared the top four videos on this list as part of their collaboration with member stations. We also took advantage of the opportunity to collaborate with 89.7 NPR News as part of WOSU Public Media’s Chasing the Dream series, which focuses on telling stories about what it takes to get ahead in life today. Though our Chasing the Dream stories are local, the themes — employment, wages, poverty, class and access — are universal and resonated with NPR’s Facebook audience. The videos on this list are as varied as our program, from issues our communities are facing to fun profiles and nostalgic local history. From our two-part Season 2 premiere about Columbus and the Vietnam War to our finale featuring Westerville, we told as many Central Ohio stories as possible — and luckily for us, there are still endless more stories to tell. We were absolutely blown away by the response to our profile of Willowbeez Soulveg, a Columbus food business where soul food flavors meet plant-based dishes. Starting at farmers markets, Willowbeez has operated as a pop-up at venues including The Hills Market Downtown and Two Dollar Radio Cafe. But the vegetarian restaurant will soon have a permanent home in the King-Lincoln District. Producer George Levert met brothers Carnell and Malik Willoughby and got straight to our most burning questions. “Where’s the soul come in?” he began. Over one million views(!) later, this is our most-viewed segment of all time. You’ve got to get a good job to get ahead. But what if you don’t have a car to get to that job? We follow a woman who travels by bus more than an hour one way to get to her job. Housing is the single biggest expense for many people in Columbus — especially those who are working in lower paying jobs. Even if they get a better paying job, it may not be enough if their housing costs and property taxes go up. Learn how the surprising and far-reaching problems caused by poor dental health keep some people from moving up. One issue is access to dental clinics — while Clintonville and Dublin are home to more than 30 dental clinics, neighborhoods such as Linden, Franklinton and Old North have only one or two. Now known as Rickenbacker International Airport, Lockbourne Air Force Base, just south of Columbus, was a bustling military operation during the Vietnam War. Author Robert Stroup II tells us about the cargo plane and heavily armed gunship crews that trained at the base, and Ron Albers discusses piloting the massive KC-135 refueling tankers when Lockbourne units were sent into the Vietnam theater. In the 1950s and ’60s, the Great Western Shopping Center on West Broad Street was home to the incredible Walk O’ Wonders, featuring the Seven Wonders of the World. Don Casto, whose father and grandfather developed the site, and Steve Skilken, of Joseph Skilken & Co., share memories and more. Architect Louis Sullivan was Frank Lloyd Wright’s mentor and is considered the father of modern skyscrapers. Newark is restoring its jewel-box bank created by Sullivan in 1914. The Licking County Foundation plans to transform the landmark into a public space this year. The first concrete street in America was poured in Bellefontaine, Ohio, in 1891 — and it has a connection to Kate Quickel, host of WOSU’s Broad & High! We headed northwest to learn the story behind this 20th-century innovation. We originally created this how-to story for our Family and Community History episode in Season 1. It became so popular that we decided to reprise the segment in Season 2 for our Columbus in Photographs show. The Wagnalls Memorial in Lithopolis, Ohio, is indeed a memorial — but it’s also so much more. Columbus architectural historian Jeff Darbee takes us on a tour of The Wagnalls Memorial Library and Community Center to learn about its history and current role in the community. On the Season 2 finale of Columbus Neighborhoods, we take a look at how history shaped the Westerville we know today — from the Underground Railroad to the Temperance Movement. This entry was posted	on Tuesday, June 5th, 2018 at 12:25 pm	and is filed under Blog, Story. You can follow any responses to this entry through the RSS 2.0 feed. Both comments and pings are currently closed.